What is the difference between the Elven Way and the Fairy Faith? Many folks who do believe in elves and faeries and in Fairie and Elfin do so from the outside looking in. They may have astral or etheric or intuitive interactions with the Faerie world but they often see themselves as being separate from it. They may channel information from those realms or have imaginal encounters or real encounters of our kind of ephermeal form but again, they see themselves as apart from the Fae, rather like someone of one country encountering a foreigner visiting their land and note that they are strangers of a different land and culture. The Elven Way, however, is the practical manifestation and realization of one’s own fae and elfin nature in the world. We find Elfin within us and we express that energy through our own lives and beings. We don’t view Elfin and Faerie or elves and faeries or otherkin as being separate from us, as being foreigners, but as kindred to us, even in those cases where we do experience some of them in etheric or astral forms. In this way, it is perhaps more like someone who meets a visitor from another land, but it is a land that one’s ancestors migrated from and one knows that one is related to this person, even if it is in some distant fashion. Thus it is the case in the United States of America, at least, a person might call thems’elves an African American, or an Italian American or a Japanese American and so forth. The same sort of thing can be observed in those who are French Canadian. There is a recognition of one’s ancestors in doing this and a connection to one’s ancient land and people. We, as it happens, are Elven American. But the Elven Way is not only a cognizance of our essential elven nature, an acknowledgement that our beings are essentially based upon spirit rather than matter, it is a determined effort to manifest our culture in the world today. For some this is simply a fun thing to do. They wear elven fashions, put on pointed ears or faery wings and go to various festivals. And there is surely nothing wrong with this. In fact, we very much love our kindred who do this. Wish that we, ours’elves, could do more of it and certainly wish we could join our kindred in doing so. Pictures of elves in elven raiment with pointed ears are one of our favorite things. But for us Elven culture is not merely fashion or fae-shion, as some call it, but a spiritual path, a way of being in the world, a way of viewing and experiencing the world and way of interacting with others that is based upon the way of ‘we who are the Fair Folk.’ Following this path has altered our entire lives. Not only has it brought elfin magic into our lives and elfin kindred into our lives, which is a great magic in it self, but it has informed the way we proceed in the world. As far as we know that is not the case with those who practice the Fairy Faith, although it surely has set them apart from the vast majority who would and do ridicule them at times for believing in elves and faeries just as those same folks attempt to deride us for being elves and faeries. And that has pushed those of the Fairy Faith closer to Elfin, nearer to Faerie and closer, oh, so much closer, to us. Our hands and hearts are reaching out to them. They just need to grasp the reality that we are here and we are elves born in human bodies, although frequently they are determined that elves and faeries can only manifest in ephemeral form. Still, when they are ready, we are here for them. Oh, and if they want to give us presents, as ancient lore suggests they do, that’s okay with us as well. Click on the link above to find out more about this book and to read excerpts. What most people call consciousness is an awareness of their thoughts, beliefs and ideas. In the animal kingdom, consciousness is an instinctual awareness and lacks, for the most part, the beliefs, ideas and self-concepts found among humans. In the human being, the idea driven consciousness comes to fore but, as we’ve pointed out already, this is primarily directed and motivated by ideas ruled by our passions and emotionally connected ideas. We think ours’elves to be free but really our lives are controlled by these passions and beliefs. When we are born into a particular life we come bearing the imprint on our souls of our pervious experiences. Obviously, when we are reborn we don’t have the same body. So our bodies, as they currently exist, clearly are not a part of our immortal s’elf, although they are composed of the energy that is, in its’elf, immortal. We are mostly formed from Star-stuff or Stardust, and elves are particularly aware of this fact. So when we come into a new life, our soul/spirit gathers around it the available stardust/energy to form a new body. Since this stardust also bears the imprint of its past, in the form of a DNA coding directive, we also come into each life with a racial consciousness, formed in what is often called the Collective Unconscious. We also have a human consciousness, and bear the imprint of our evolution through various forms from all our previous incarnations. To become truly immortal beings, that is to say, immortal in the way that vampires are seen as being immortal, having a permanent immortal physical body, we need to integrate our consciousness with and merge with the consciousness of the energy that temporarily composes us. Of course, elves are often also seen as being Immortal, particularly in our more ephemeral forms, or our ethereal or etheric bodies combined with our astral bodies. In time our bodies will become more resilient, less physical, and more like light, thus more ephemeral. The dimensions we will reside within, the dimension of Elfin/Faerie will be similar to living in a dream. We will have greater powers, such as the power to fly, and the ability to do things that we can now only dream of doing. And yet it will be every bit as real as a dream seems when we are in it, or every bit as real as this illusionary world that we currently abide within. Also, just as clearly when we pass from one body to another, we don’t carry our thoughts, feelings and beliefs with us, or our memories, unless indeed we have obtained continuity of consciousness and have born our mind through the death process, which, honestly, these particular elves are nowhere near to achieving. Are you? If you are, you will be able to tell because you will be able to remain aware throughout the night as your body sleeps without losing consciousness. Sleep, as we said, is the little death. It is the reflection in microcosm, As Above/So Below, As Within/So Without, of the life death cycle. For most individuals, the death experience and the assumption of a new stardust body is like suffering from total amnesia. You don’t remember anything. You don’t even know what you know. For instance, in amnesia, you may know how to type or play a piano, but don’t you know that you know how to do it until you sit down at a typewriter, or computer, or piano and suddenly find that typing or playing piano comes automatically to you. So, too, in moving from one life to another, we carry certain abilities with us. We don’t necessarily know that we know, rather we feel we were born with certain talents and abilities, and indeed we were. Usually, we find we learn these things very quickly and easily. These skills seem to come naturally to us. Our feelings, not so much our emotions, but mostly our feelings, because they are by their nature essentially unconscious, come easily through the transitional state of death. We may not remember whom we loved or liked or disliked, but if we encounter them again or someone like them we immediately sense our attraction, or our repulsion. There are certain individuals that we know immediately even though it seems we have never met them previously. So until we are able to carry our memories from life to life consciously, they are still born in our soul, particularly those things that are most important to us, which is love and relationship, as well as having an instinctual recognition of and attraction to those with whom we have a karmic connection either positive or negative. We can see this fact reflected in our current life in our conscious and unconscious. The basic consciousness is everything of which we are currently aware. But we also have an unconscious which composes everything of which we are not aware, which for most of us is far vaster than our conscious awareness. Consider all the things we don’t know, and add to it all the things, events, facts, people, experiences we have forgotten, which are stored in our brains but which, for most of them, are lost to us except at certain times. So, too, are our experiences stored in our soul, but only accessible under certain profound circumstances, although occasionally brought to mind by our encounters in the world, just as memories may be brought back into consciousness by a particular, song, smell, or experience. Our soul stores all our experiences and in that way is linked to the Akashic record, which records all experiences of all beings. The Akashic record is the library of the Soul of the Universe. WHERE EACH RECEIVES HIS DUE. THE MEMORY DOES NOT FADE. What is your magical Elfae or Otherkin tribe? We invite you to read about our newest book release THE ELVES SAY: A Collection of Over 1000 Ancient Elven Sayings and Wise Elfin Koans by The Silver Elves, Volume 2. THE ELVES SAY: A Collection of Over 1000 Ancient Elven Sayings and Wise Elfin Koans by The Silver Elves, Volume 2, is the second in the Elf Quotes Book Series, which contains The Silver Elves’ own original elfin koans, ancient elven sayings, and their other quotes of wisdom on the Elven Way. While volume one titled Elf Quotes contained all the elf sayings from the first 37 of the Silver Elves’ books (all of the side-quotes in their books that were published throughout the years to that date), volume two contains quotes from their four latest books published since the time of the first volume, the daily quotes they publish on Facebook, along with the largest majority of the quotes in this book being shared and published for the first time. THE ELVES SAY is both an inspiring and enchanting book, and enjoying the many koans, riddles, sayings of the elven eldars, and quotes of ancient knowledge of the elves will surely assist you on your journey to enter the magical realms of Elfin. Come join ‘Elf Sayings from the Silver Elves’ on Facebook for a new inspiring and magical elf saying each day. Touch this shining elf star for an Elven Blessing! Is the Elven Way a Religion? The path of the elven is not religious in any way but is rather a spiritual quest of the individual’s effort toward the development of each one’s own s’elf and soul, which is to say one’s connection to the rest of the Universe and the Divine Magic from which all things spring. In other words, the miraculous nature of our existence. None-the-less, many folks upon discovering that we are elves jump to the conclusion that we must be a cult of some kind. This is particularly so when we have an elven community no matter how large or small. This assumption is, of course, understandable because quite often when individuals in modern society encounter a group with strong philosophical, spiritual or religious beliefs they are part of a cult. But at the same time, this jumping to the conclusion that we elves, individually or collectively, are part of a cult is really just laziness on their part, an unwillingness to actually discover what we are about. However, that just tells us that they are not elven or not ready to relinquish their enculturated social views enough to truly examine their selves or us and that we simply have to respect. You can’t drag people kicking and screaming into Elfin. The results would be unsatisfactory for them as well as us. All we can really do is understand their reluctance and hesitation. Nurture them as best we may and, in most cases, move farther and further along our own path and leave them to theirs as best they can understand it. If fate or destiny should bring us together again, we will sprinkle another touch of stardust upon them (without them realizing it ever happened) and await the fulfillment of the magic. Could there be an elven cult? Cults are almost always centered around a charismatic personality, an inspiring leader and we elves are not immune to such personalities. In fact, being charismatic is nearly a description of elves in general, and we surely find such individuals intriguing. Even when we are introverts, we tend to have a certain charisma about us, although the fact that we are magical folk and radiate elfin/faerie magic often means that people are both attracted and repelled by us, which is to say they find us fascinating, when in fact they are able to see us at all, while being uncertain about us, until they actually get to know us. This is especially true of those who are paranoid and suspicious anyway and prone to superstition. For our own part, while we enjoy charismatic folks, are in fact fascinated by geniuses of various sorts, and surely would find a powerful elfin figure enchanting, we are seldom fooled for long. If that individual is really all about hir own s’elf and fails to foster the individuality in the kindred, we would soon fade from hir, just as sHe (she/he) in centering everything on hir own s’elf instead of nurturing the elves around hir would become more and more distanced from Elfin and the source of elfin magic. Some of us, perhaps most of us, may be fooled for a short while, but only a very few will be taken in for a long period and those we expect have some karmic duty to fulfill in doing so, some inner need of their own as well as a need to serve the charismatic other, whom we assume and hope in time will overcome hir own inner emptiness and begin to accomplish the task of encouraging our beloved fae folk, which, after all, is the true purpose of such power. So, while cults may develop among the elven, they are unlikely to last very long, we are simply too eccentric, unique and diverse as individuals for it to be otherwise. Come join us on Facebook under the name Michael J. Love (silver elves). 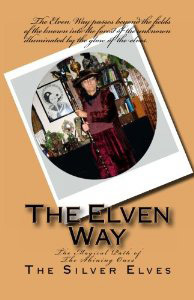 In these past few years and have now written and published 22 books on elven magic and enchantment. We hope you will visit our website where all of our books are displayed and you can find samples of our writing for each book on the “Sample Our Books” link. Also, please enjoy our “Elven Tree of Life Eternal” maze to explore your magical s’elf and feel free to request an elven name in the language of the Silver Elves, Arvyndase (instructions for this free gift are on the “Want an Elf Name” link) : http://silverelves@live.com . Enjoy! One of our most recent books is “The Elven Way” and we wanted to share with you the following excerpt from Chapter 1 on “Awakening”. “We come to understand in time that in order to succeed in the world, to succeed as spirits, we must follow certain percepts, rules, or laws of magic. Again, these are not arbitrary rules but absolutely essential to the evolution of our spirits and our souls. They are the Way we evolve and succeed, become who we truly wish to be, which is to say who we truly are and live as Immortal Spirits in the Eternal Dimensions. We call them therefore the Elven Way. “It may be defined very easily by stating this simple formula: We are free to pursue our own magical creative course as long as we do not obstruct and interfere with others who are doing the same. Clearly, we have the right to defend ours’elves and thus prevent others from interfering with our way, if our way is true, and to prevent them from obstructing others.